Rediff.com » News » Is MNS targeting north Indians in Mumbai again? Is MNS targeting north Indians in Mumbai again? 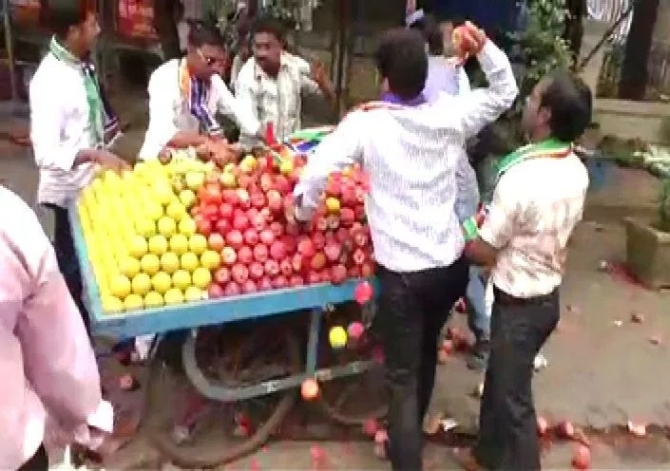 Five workers of Maharashtra Navnirman Sena were arrested on Thursday for allegedly assaulting a north-Indian fruit seller in suburban Ghatkopar after a video of the incident went viral on social media. "We arrested five people in connection with beating up of a fruit seller yesterday," a senior police official said. In the video circulated on social media, a group of six to seven activists were purportedly seen slapping and abusing the vendor in Amrut Nagar area of the suburb. They also upturned his cart. However, the Raj Thackeray-led party said that it was just a "coincidence" that the vendor turned out to be a north Indian. "We have arrested the accused and the preliminary investigation is going on," the official said. The party workers had warned the vendor not to sell fruits at the spot a day before the incident. The incident drew sharp reactions from BJP and Congress, with both parties demanding a stern action against the MNS workers for trying to "vitiate" the atmosphere through their anti-north Indian agenda. Former minister and state Congress vice-president Naseem Khan slammed the Raj Thackeray-led party over the incident. "This party has lost relevance in state and in city. Now seeing that the BMC elections are round the corner, MNS is trying to create a venomous environment in name of language and the place of origin, which is neither accepted and nor would be tolerated," he said. Khan said he had spoken to DCP of the area, who has assured him to deal sternly against the attackers. The ruling BJP also condemned the incident, with a delegation of north Indian leaders meeting DCP Rajesh Pradhan. Mumbai BJP general secretary Amarjeet Mishra, who led the delegation, said, "We have demanded that senior police officers take most possible strict action to send a strong signal against such hate-mongers so that no one would dare to repeat such an act". MNS, however, debunked the accusation that the vendor was attacked because he is north Indian. "The fact is that our party has launched a campaign to promote local farmers to sell their fruits because they have the first and foremost right to sell their products," MNS vice-president and spokesperson Vageesh Saraswat, a north Indian himself, said. "It was merely a coincident that the vendor was an north Indian. Despite the fact, our party workers are ready to face cases for the sake of promoting local farmers," he said. MNS was formed in 2006 by Raj Thackeray, the estranged cousin of Shiv Sena chief Uddhav Thackeray, on the sons-of-the-soil agenda which was originally nurtured by Sena supremo late Bal Thackeray. In October 2008, MNS activists beat up North Indian candidates appearing for the all-India Railway Recruitment Board entrance exam for the Western region in Mumbai, drawing sharp reactions from across the country.